Raghu Juvvadi, M.D. completed a Fellowship in Nephrology in 2011 and a Fellowship in Geriatrics in Florida. He received his Bachelor of Medicine and Bachelor of Surgery (M.B.B.S.) in India in January 1998. 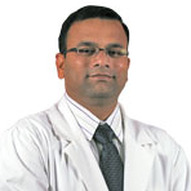 Dr. Juvvadi has been extensively trained and has an impressive medical career both in India and the United States. He served as a clinical research assistant at UMDNJ in New Jersey from 2001-2002. He served residencies at Frankford Hospital in the Jefferson Health System in Philadelphia and Allegheny General Hospital, Pittsburgh, PA, where he was awarded the "Overall Dedicated Resident Award". Dr. Juvvadi served as a research assistant and contributed to a wide range of publications in the Journal of Clinical Oncology, and Ninth International Symposium on Myelodysplastic Syndromes in Florence, Italy. He is particularly proud to have received Best Resident award during residency and overall dedicated resident award at the graduation ceremony. Dr. Juvvadi speaks fluent English, Hindi and various native languages in India and has a working knowledge of Spanish. He lives with his wife and two children in Spring Hill.